Sonia believes passionately in awesome exposure! Awesome exposure = awesome results. Sonia advertises your home 24/7 until it is SOLD! She invests money and time into her client’s listings by hiring her media team to take professional photography and videography of each listing. Sonia is extremely active on all social media, constantly promoting her listings, and exposing them to thousands of people every day. 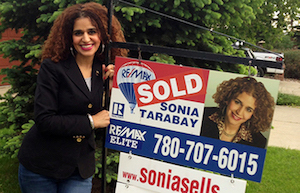 You’ll see Sonia personally promoting your home on Facebook, LinkedIn, Instagram and Twitter. In addition, you’ll see Sonia’s listings in the local newspapers, MLS.ca, Realtor.ca, and her website SONIASELLS.com. Sonia personally hosts public open houses every weekend! She is very hardworking and dedicated to serving her clients at all times. Her staff look after the administrative duties and other client care responsibilities to ensure your experience is a happy one. List with Sonia and get a Tiger on your side! Top Negotiator - When you choose Sonia to be your Sherwood Park or Edmonton real estate agent, you can be sure she will fight to get you the best possible price for your Edmonton home. Her flawless track record, tough negotiating skills, and relentless dedication have made Sonia the real estate tiger she is today. Area Knowledge - Having grown up in Edmonton and lived in Sherwood Park for years, Sonia's appreciation and love for the city grows each season. Her nuanced understanding of the Edmonton area real estate market, family history in the business, and in-depth community knowledge combine to give her a competitive edge. Strong Presence - Spot her in Sherwood Park, spot her in Edmonton and surrounding areas! Like a leopard, Sonia is easy to spot. She leaves her prints everywhere and has taken the Sherwood Park real estate industry by storm. When you list with Sonia, your home will receive maximum exposure! Home Staging and Photography - Sonia doesn't just sell homes, she helps her clients prepare for the entire selling and showing process. Using expert home staging techniques and professional photography, homes listed with Sonia are beautifully staged, attract the right types of qualified buyers, and sell for top dollar. Take a look at some of the testimonials from Sonia's clients, they all agree: with Sonia it's SOLD! Mortgage Pre-Approval - In addition to being a top Edmonton and Sherwood Park REALTOR®, Sonia is also a qualified Mortgage Broker with Verico iMortgage Solutions. When you buy real estate with Sonia, you benefit by getting a real estate agent and a mortgage specialist rolled into one, making your buying experience less stressful and more streamlined. If you're ready to learn more about selling Edmonton or Sherwood Park real estate with Sonia, call 780-707-6015 or send a message using the form below. Sonia's marketing plan turned into a frenzy of showings on the first day and multiple offers on the second day! Watching her negotiate for us was an awesome experience. Sonia's professionalism and knowledge of the real estate business is outstanding. She promised us a quick sale and she sure delivered! We recommend her to everyone selling a home. ﻿Sonia was hired by clients of mine on a Thursday night: By 3pm the next day, the home had been professionally photographed, a 360 degree 24/7 virtual tour had been filmed and posted, and their home was up on her website. By the end of the weekend, they had multiple offers, sold for over list price, and with a quick possession date. Wow, wow and wow again!